as in years past i decided to keep a few snowmen decorations out. who says snowmen are only for the holiday season? it seems really barren with out the trees and lights and i think the snowfolk are sorta cheery. "i especially enjoyed your note about where your creative influence came from. it touched my heart and invoked memories of my grandmother, she was creating some- thing all the time, whether it be cake decorating or crocheting or candle making or sewing, she was the most talented person that i have ever known. i got my influences from her. she did not make many cloth dolls but she crocheted and knitted dolls and toys. she did have a love for making most anything with her hands and felt a need to be creating at all times. i never saw her sit in front of a tv or radio without something in her hands, she thought that was time wasted and fit her crafts into every free moment. she was a devout catholic and worked many years as a cook in a convent, she did that until she came to live with my parents and my brother and i. i watched her sew on her treadle singer machine for hours at a time. i believe this wonderful lady was my creative influence. i am looking forward to this new year and exploring primitives a little further, since i am relatively new to them. i have noticed a growing interest in primitives in the last year or 2. for a long time all i ever saw in craft malls were country and cutesy types of dolls, now there are more and more primitives. 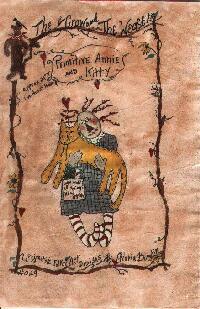 i am looking forward to getting my hands on some kindred spirits books and patterns! "I loved the tribute you put in the newsletter about your mother. I was taught to sew when I was eleven by a neighbor. She was the type of person who believed in good technique and taking the time to do things right. She gave me a wonderful lifetime gift and I think of her often as I work on my projects.Take care and Happy New Year"
"I am working on my new '98 line now. I have 3 weeks to design new items to sell wholesale. I have to cover all the seasons too. I'm starting on Easter stuff and will go on to the next holiday as I design. I have had a hard time getting motivated since I took off so much time during Christmas but it started coming to me yesterday afternoon. THANK GOODNESS!!!! I am being very inspired right now by the old German made holiday items of the late 1800's. I am using old fabrics which gives everything a very old look. When designing finished product to sell wholesale this year I am planning on making as much as I can using old fabrics. This is how I started out and I want to get back to that. Old stuff is harder to come by and cost more which means I have to charge more but I feel there is a demand for the old stuff. 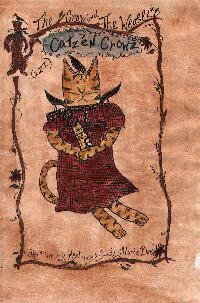 I will have new patterns available in Feb.98 and I plan to design some "more primitive" designs. " "In response to Joanie's question. I have a 3 and 5 year old and it is rare that I get long periods of time to craft so I have to be ready to put down my work and take it up again later. I have found some ways to keep my work ready for 10 minutes here and 15 minutes there. For painting I use an old typing table so it is mobile, with my paints in a rolling cart. An old bath mat on top of the typing table protects it and also keeps drying items from sticking. A small wet sponge inside my palette keeps my paint from dying out so fast. There have been times that we have a crisis and I don't get back to my painting till the next day and the paint is still not dried out. Having the typing table I can leave my paints out and roll the cart away. If you have to put everything away and then get them back out you are loosing crafting time! I also have a canvas apron that I wear when I craft. I used to wear certain crafting clothes but when I had to change into my old clothes it would take away valuable crafting time. Now I throw on my apron and get to work. Any other projects (such as textiles) I work from a cardboard under bed storage box or a plastic storage box keeping all the tools in it.This enables me to put it away quickly, then when I am ready to work I pull out the box and all my supplies are still together. I also find this works to keep scraps and threads in one place for easy clean up. It also gives mobility, I can go from room to room as I need to, I found this box idea to be great for camping trips! what will the big items be this spring? do most of you do spring shows or stick to fall & holidays? worms in winter coats? . . . if your temprature dips below freezing you can take advantage by placing furniture that has worm damage out doors for several hours. this helps to kill the worms and prevent further damage. this can also be helpful for sweaters that you suspect are being damaged by moths. mind music . . . are you in a creative slump? studies support that listening to mozart allows faster intergrated access to more information in the brain. this is caused by more complex connections grown when exposed to the music of composer wolfgang mozart. it's known as the "mozart effect". cost is $1 and send a long self addressed stamped (.55) envelope. on the Homespun Peddler Wed Site. kindred spirits catalog page at Homespun Peddler. So is my love for you my friend. pals: in your own opinion, what is the difference between "country" and "primitive"? gb: "in the last few years, country & primitive have sort of blended. the difference for me has to do with textures, shapes and colors. i think of country as 'cutesy' compared to mis-shapen etc. i even categorize primitive as 'mild' to 'deep' ." pals: What makes the best subject matter for primitives? 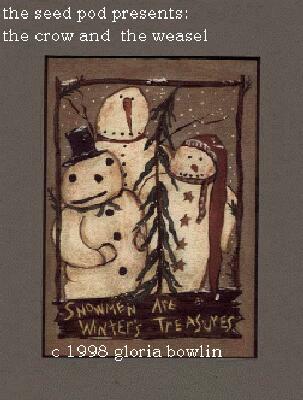 gb:"i prefer snowmen, bit i'm not sure if it's because they make the best subject matter, or if it's because i love & collect them myself"
pals: If you were to create a starting up kit for a primitive artist, what would be the "must have" items it would include. gb: "aged muslin,old buttons,some sticks,& rusted wire (and glue of course)"
pals:What colors and fabrics do you most associate with primitives? gb: "i like using muted,aged,fabric and dark colors. old wool,flannel,μslin are the fabrics that come to mind,when i think of primitives." pals: Can you site any new trends in primitives? gb: "primitive designs seem to be gaining in popularity. some things labled 'primitive',do not in my opinion qualify. 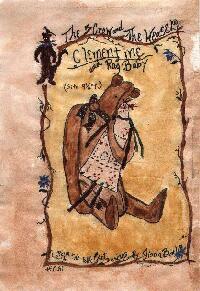 (even my own designs) i refer to them as country,primitive,folk art one name is bound to be right." pals: Tell us about you as a designer, what are your favorite things to design (dolls, wall hangings etc)? gb: "i just love dolls... but i try to design most items with options for display. (since my stuff is not for kids) wall-hangings are space savers for collectors." pals: How long have you been designing/have you always done "primitive style" or did it evolve from another style? gb: "i've always loved antiques, so things with an aged appearance have been a priority. i must admit, i used to make more 'cutesy' things, though. the 'market' sort of demanded it"
gb: "i've noticed that middle of the road designs will probably sell to a larger group of customers, but since my own preference is what i call 'deeply' primitive, i have difficulty designing some things. ( i collect things that look as if they belong in the trash! )i just wondered if other artists are faced with that dilemma. it's hard to stay true to your own style, because,after all, we are in the business to make money,so ,at times we may compromise to accommodate the market."